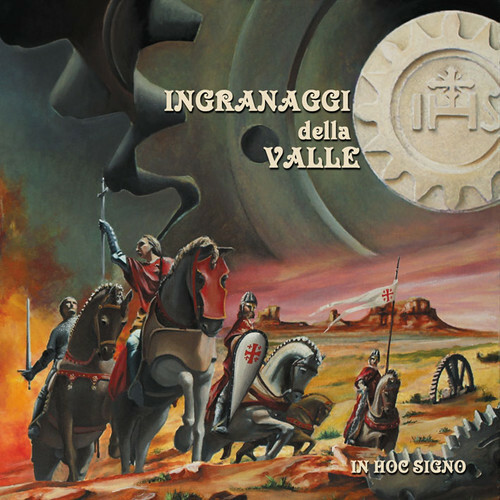 Ingranaggi della Valle (IDV) (formed in December 2010) is another of the many new, young Italian bands exploring and extending the classical Italian progressive movement of the 70s. In Hoc Signo, Latin for in this sign, is their debut release. Playing a collection of vintage instruments (Mellotron M400, Hammond B3, Mini Moog, Elka Synth, etc.) they have produced an incredible collection of classically influenced songs ranging from Baroque music, symphonic and hard rock, to jazz-fusion. The band members are Igor Leone (vocals), Mattia Liberati (keyboards and synths), Flavio Gonnellini (guitars and backing vocals), Marco Gennarini (violin and backing vocals), and Shanti Colucci (drums and percussion). They are already garnering attention from established bands. Mattias Olsson from Änglagård gave them arrangement suggestions and appears as a guest performer on “Jangala Mem” and “Il Vento del Tempo.” Moreover, David Jackson, whom you know from Van der Graaf Generator, heard their demo and was so enthusiastic that he appears on flute and sax on the closing track “Finale.” IDV definitely can trace their roots to 70s Italian prog (Le Orme, Banco, Area, Delirium, PFM, Osanna, etc.) as well as Soft Machine and VDGG, but their sound is far from derivative. They have learned from the masters and have extended the genre by adding a new edge to the music. Some of the high points for me are “Cavalcata,” “Fuga da Amman,” “Il Vento del Tempo,” and “Finale.” The weird sounds credited to Mattias on “Il Vento del Tempo” also integrate references to Jorge Reyes and his primitive Mexican music. And not only is the music outstanding, but the cover artwork is just as good. This is another recommended Black Widow release.